So you’ve got your wok, but now you need the cookbook. If you’re lucky you could be receiving a SIGNED COPY of Stir Frying to the Sky’s Edge, winner of the James Beard Foundation Best International Cookbook Award! Grace Young and her publisher, Simon & Schuster, have graciously agreed to donate a cookbook for Wok Wednesdays! Leave a comment below and let me know the BEST Chinese food experience you’ve ever had. It’s that easy! You have until 11:59pm EST next Saturday, May 5th to enter! 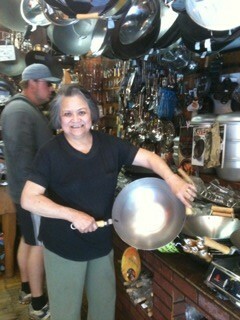 Congratulations to Jill Godin who won a free wok courtesy of The Wok Shop in San Francisco! Thanks also to everyone who entered, there were some great questions and I’m going to compile them into one awesome FAQ page where Grace Young will address some of the most common problems and questions people have about their woks. Check back later tonight for our next giveaway! THANKS TO EVERYONE WHO ENTERED! THIS CONTEST IS NOW CLOSED. A WINNER WILL BE ANNOUNCE MONDAY, APRIL 30TH. I am so excited to announce our very first Wok Wednesday Giveaway! Thanks to Tane Chan, owner of San Francisco’s The Wok Shop, one lucky Wokker will win a brand-new 14″ flat-bottomed carbon-steel wok! Leave a comment on this post telling us your biggest wok or stir-fry related question. Not sure how to season your wok? Don’t know where to find ingredients? Let us know and you could win! Comments must be left by 11:59pm EST on Saturday, April 28th. One winner will be picked at random and announced on Monday, April 30th, along with our next giveaway! As we lead up to our start date we’ll have exciting giveaways each week, so be sure to check back every Monday! Many thanks to Tane Chan of The Wok Shop for donating the wok and covering the shipping costs! Located in the heart of San Francisco’s famous Chinatown, The Wok Shop is a family–owned and operated business specializing in hard–to–find Asian cooking tools. Our unique stock of merchandise covers nearly every aspect of Asian cooking! For over 35 years, we have enjoyed an excellent reputation for having a knowledgeable and friendly staff prepared to answer the toughest of customer inquiries. Posted in Giveaways and tagged grace young, the wok shop, wok. Bookmark the permalink. So you’ve gotten your wok and are ready to get to stir-frying. First things first – you need to season it. It might sound scary, but as Grace shows us below it’s really quite simple! Posted in Wok Care. Bookmark the permalink. Sign up for Wok Wednesdays! You will receive a reply confirming your participation; after that all communication will go through the Wok Wednesdays blog. Inspired by the group Tuesdays With Dorie, and encouraged by some fellow foodies, I’ve decided to start a bi-weekly cooking group that is all about the wok! We’ll be cooking our way through Grace Young’s Stir-Frying to the Sky’s Edge, a must-have cookbook for any wok enthusiast. Whether you are a season wok-star or a wok newbie, you’ll definitely have fun as we share our stories and experiences from cooking the recipes. We’ll be starting off on Wednesday, May 16th. The recipe and schedule for the rest of May will be up towards the end of April.